We got the call on Wednesday morning. We provided our details to our contact at the plant so we could be granted access to the facility the next day. When we arrived at the plant, which is along Lake Michigan (see map), we were greeted by a female armed guard who unfortunately had no idea who we were. After consulting with her colleagues, our identities were made known and we were allowed to drive into the compound. As a first step we got a short safety briefing and learned more about the owl that had been seen for at least three days inside the generator building. Hard hats and safety goggles were distributed and we headed back to our car in order to proceed to the main event. But first, our car had to be searched. We drove to the checkpoint, left the car and watched a security guard give our minivan the once-over, including using mirrors to check underneath the car. After our car passed inspection, we parked at the generator building and carried our equipment to the next security point. Although we had already given our details over the phone the previous day, and to the main security gate just moments earlier, we again had to provide ID cards and personal details to this latest security guard. He proceeded to telephone our information to another security person who had control over the one-way gated doorway into the main part of the building. Luckily our credentials passed with flying colors and we were allowed to awkwardly shuffle into the building where the owl had been spotted. 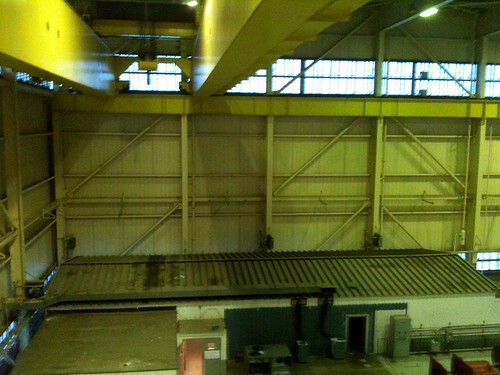 The generator building was enormous! Our guide, Angela, showed us where the owl had most often been seen. It would often perch on metal support beams near the ceiling. While the bird had been seen fairly regularly by multiple plant staff over the course of the previous 3 days, we learned that the owl had last been seen that morning, about 12 hours prior to our arrival. Several of the building’s windows had been left open the night before, and though the owl was seen the next morning, there was a period of about 30 minutes between the last owl sighting and the last window being closed. Chances were good, therefore, that the owl had left the building on his own sometime that morning. There was also speculation that the owl may be one of a possible nesting pair in the building, so we conducted a search. We had taken an elevator up 4 floors to the main part of the building, and then we climbed four flights of open stairs to access a catwalk in order to search the beams for the owl or possible owl nest. 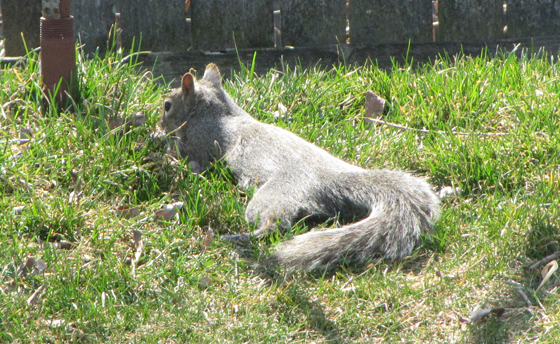 Our search proved fruitless as no owl was spotted and no signs of a nest were found. We hope that the owl indeed left of its own accord. Even though we didn’t find what we were looking for at the plant, it was a really interesting visit. Neither of us realized there was a nuclear power plant in Zion, although it did sound a little bit familiar to me. The Zion Nuclear Power Station was in operation from 1973 to 1997. 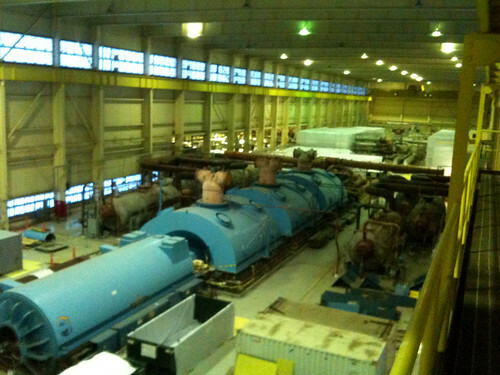 The plant is currently licensed to the company EnergySolutions, which is working on dismantling the site. This process will take about ten years. It was EnergySolutions staff that escorted us through the owl search and we learned a lot of things about nuclear power plants that we didn’t know before. There are only five more Space Shuttle missions before the program is retired. We had a great time viewing the launch of STS-129 in mid-November. We planned our schedule by using information provided to us by NASA that accompanied our tickets, and reading a few trip reports made by other shuttle fans. 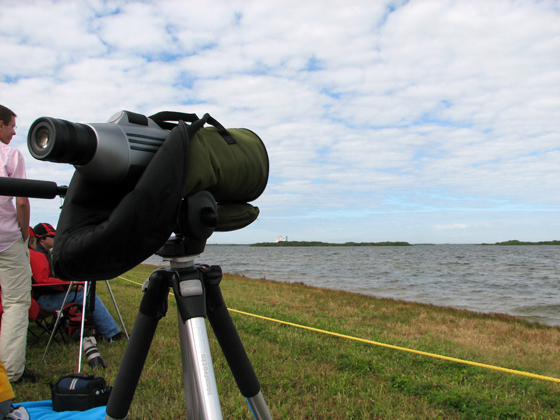 Here are my tips for making the most out of viewing a shuttle launch from the causeway. Wear shoes, not sandals. I love my Tevas and wear them almost exclusively in the spring, summer and fall. They were the only shoes I brought with me during a holiday in India and they were all I needed. They were the only shoes I brought to Florida and were fine everywhere except the causeway. The brittle dry grass hurt my feet, I was bitten on the top of my foot and middle toe by something within two minutes of arriving and cut my heel on a sharp rock in the grass. Owie dry grass with hidden dangers. The literature that accompanied our tickets said that backpacks and food were prohibited at the causeway. We saw tons of people with both monster backpacks and buffets of food at the causeway. Just saying. We had read that in case of a launch cancellation or postponement after ticket-holders got on the bus to the causeway, one would have to purchase a new causeway ticket. For this reason we thought it would be a good idea to wait until as late as possible to get on one of the causeway buses. But the tickets are relinquished when you get in line, not when you get on the bus. Plus, as soon as you get in line you receive a voucher, shown below, which can be redeemed for a ticket once you return to KSC. We really didn’t understand how things would work in the event of a canceled launch after boarding the bus, and we were anxious about it. Hopefully this info will save someone reading this the same anxiety. We waited for about 45 minutes to get on a bus and we were among the last brought to the causeway, having to sit farther away than many others who had gotten in line and boarded buses much earlier. If we were going to do this again, we would get on the bus as soon as possible and wait out at the causeway. Especially if the chances for launch are as good as they were for STS-129 that day – 70% for go. 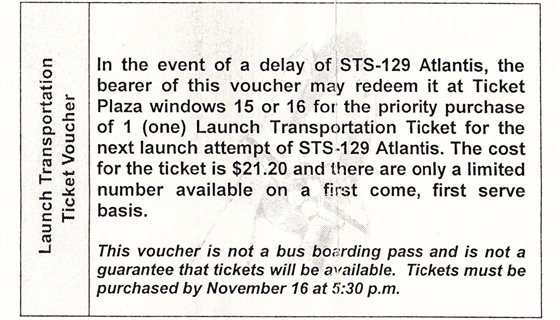 Voucher in case of launch cancellation after bus boarding. Look at the launch – especially if it’s your first time. When we got back in the bus after the launch I was surprised how many people were showing each other the videos and photos they took of the launch. Even if you have professional equipment, from your causeway viewing site your video or photos will never be as good as what NASA provides. Watch the launch, enjoy the experience, and watch the professional videos later. Bring your best optics. If you have a scope, bring it. The launch was sweet to see through the scope. 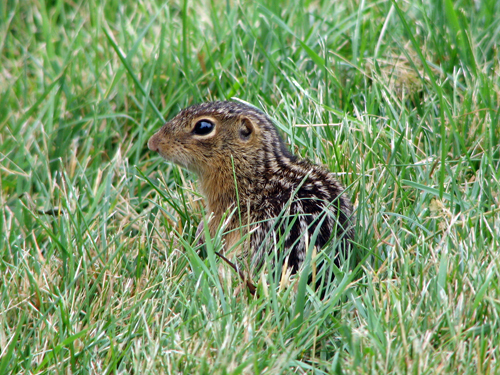 Do a little wildlife watching while you’re waiting. 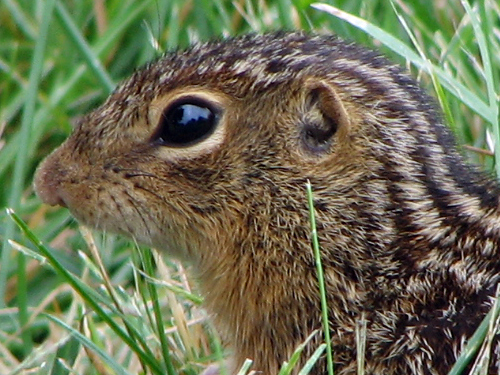 Especially if you’ve traveled a great distance to view the launch, the wildlife in Florida probably has some different flora and fauna on offer than you’re used to at home. We watched the birds, of course, including an Osprey who had a very nice view from a perch about halfway between us and the shuttle. While waiting on the bus to return to KSC, we were treated to a few dolphin sightings. 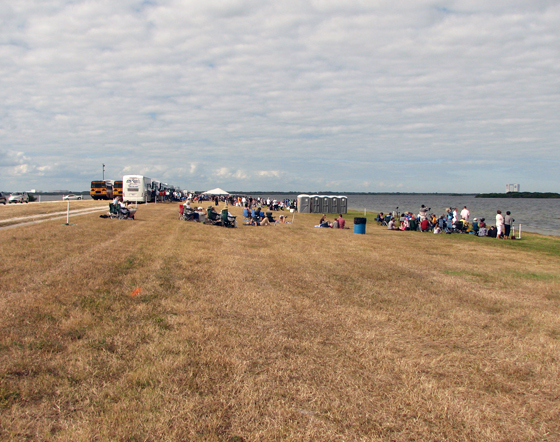 While at KSC, before boarding the bus to the causeway, there are a lot of activities available. On the morning of our launch, they were even running bus tours to the gantry and Saturn V building. Many attractions were open as soon as we were able to get inside, from 6:00AM or so. 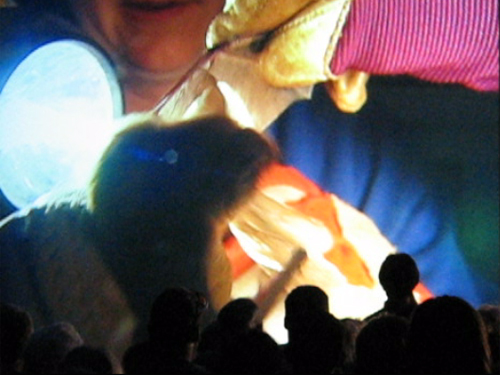 During our previous launch-viewing attempt, attractions and shops were open in the middle of the night! KSC status updates are usually interesting and they were running NASA TV in the astronaut experience building, where we got to watch the astronauts boarding the shuttle as it was happening. When looking for a place to sit on the causeway, you will probably want to find a spot where you can see the shuttle unobstructed by the small mangrove islands that lay in the water between the causeway and the launch pad. 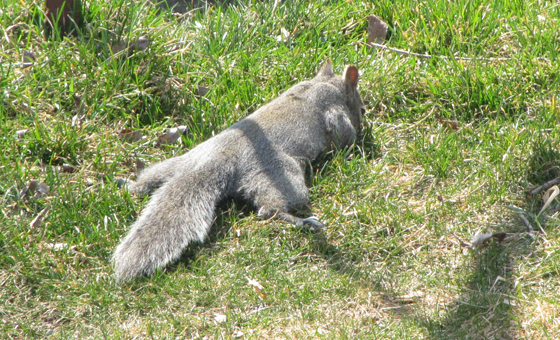 For this reason we walked further from the shuttle itself when we got off the bus. 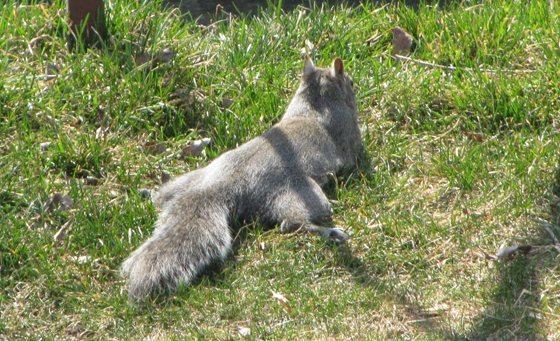 We found a prime viewing spot and were soon surrounded by other viewers. We were, however, exactly between two loudspeakers, so we had a hard time hearing the announcements. An unobstructed spot as close as possible to a speaker would have been a better choice. On the other hand, we were getting updates from SpaceFlightNow via Twitter while we were waiting, which sometimes informed us of what was going on before the info came over the loudspeakers. 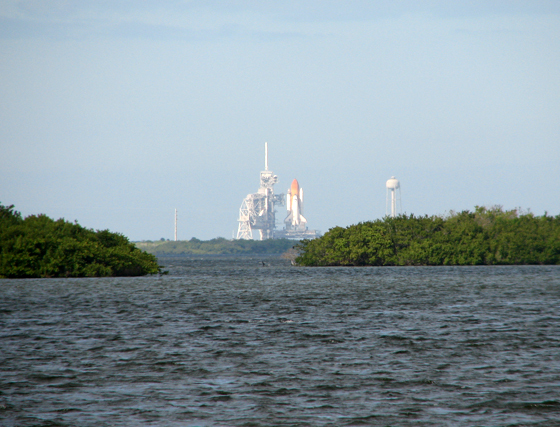 Our view of the launch pad between mangrove islands. If we had to do it all again, I don’t think we would lug all of our stuff around all morning. We got to KSC very early and had an awesome parking spot. Still we carried our spotting scope, cameras, binoculars and lawn chairs around with us from building to building until we got on the bus. If you keep an eye on the crowds and don’t wait until too late, you should be able to leave your causeway stuff in your car until you want to get on the bus. Get a handstamp as you exit so you can come back in again. Finally, tickets for the next launch go on sale this Wednesday. We had some drama obtaining our tickets, but eventually calling is what worked for us. If you’re going to try online, why not try calling for tickets at the same time? Na na na na na na na na Batfest! Last Saturday we attended Batfest, a celebration of bats by the Lake County Forest Preserve District held at Lakewood Forest Preserve. 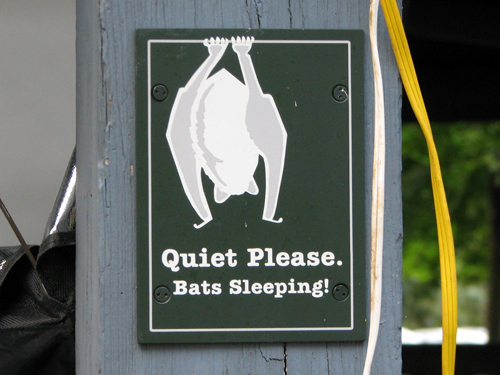 Years ago two large picnic shelters were built at the preserve, which local Little Brown Bats found to be great places to roost. Picnicking humans were not happy to find guano on their picnic tables and dropping into their food, so the district decided to rezone the shelters – one for people and one for the bats. 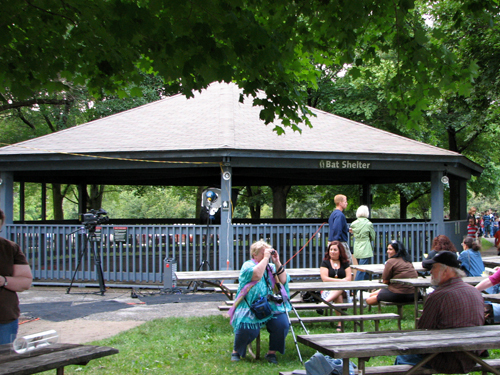 The picnic shelter was modified to be less appealing to bats and the bat shelter was cordoned off so people would not disturb the roosting bats. After the two informative presentations, darkness began to fall and it was time to look for bats. Everyone gathered around the shelter. 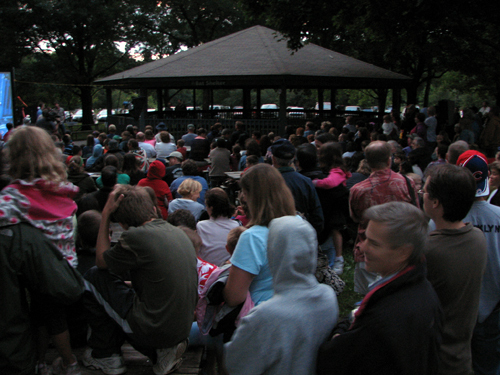 It was a huge crowd: bats are popular here in Lake County! Batfest was another great program put on by our Lake County Forest Preserve District. If you want to learn more about bats, visit Bat Conservation International. 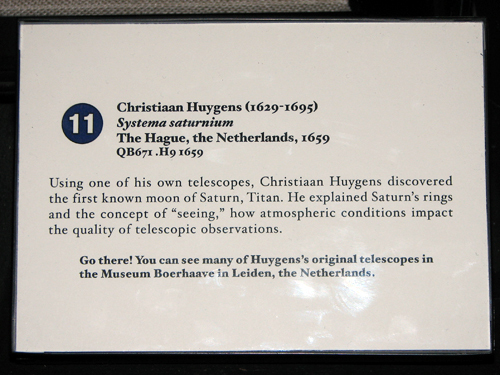 I got a big kick out of reading this placard in one of the telescope exhibits at the Adler Planetarium during our visit there last week. Our old home town has several great museums and we visited them all, including the outstanding Boerhaave. On the drive home from Florida last month, we stopped at the Jackson County Waterfowl Area in Alabama. While we were hoping for birds, we mostly saw lots of skittish turtles who jumped into the water even when we approached from hundreds of feet away. We also saw this lovely dragonfly. 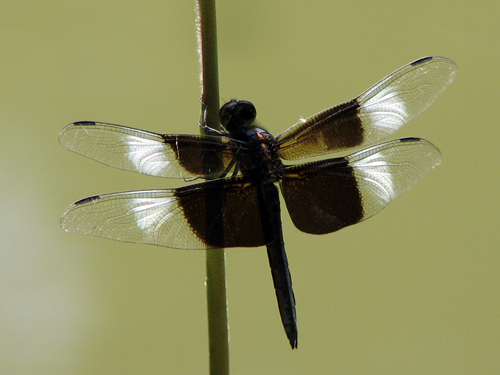 It’s a Male Widow Skimmer. I wouldn’t have known this if it wasn’t for our trusty brand new field guide I picked up just a few days before: Kaufman Field Guide to Insects of North America . Thank you, field guide. 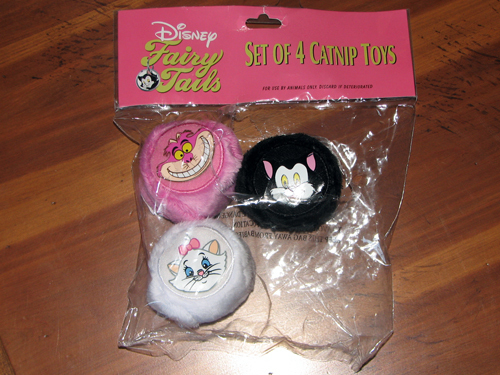 The last two times we were in Orlando, we picked up these catnip toys. Arby and Alex both loved them so much. 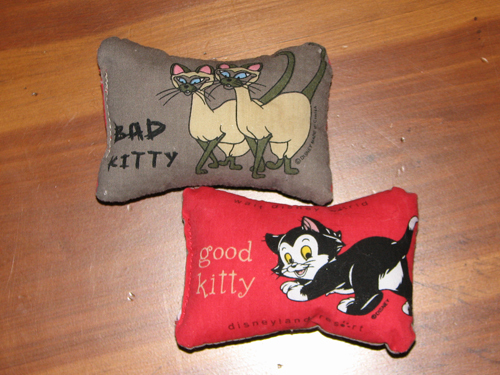 We’d gotten them catnip toys in Holland but they were totally not interested – for them it was the American stuff or nothing. Last week we spent an afternoon at Downtown Disney. 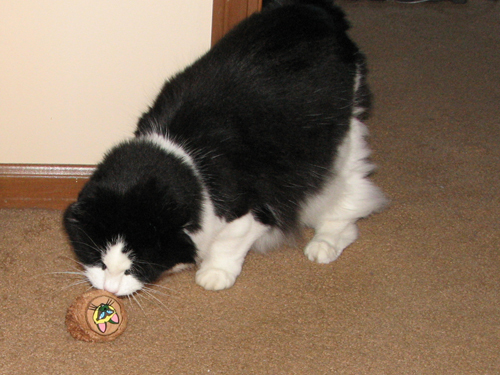 We looked for the Good Kitty / Bad Kitty nip toys but could only find these new ones. We’re still unpacking from the trip and these were sitting in a bag downstairs. I noticed Arby rooting around in the bag – when I checked, I found the toys. We’d forgotten about them so Arby found them himself! It’s still good stuff. Disney catnip is the best! Last Saturday was a beautiful day. In the afternoon we decided to try and bike to Rollins Savanna from our house here in Round Lake Beach. First I checked Google Maps to see how we could cycle and avoid busy roads. The Google Streetview feature works for a lot of our area, so I could follow parts of the route online. 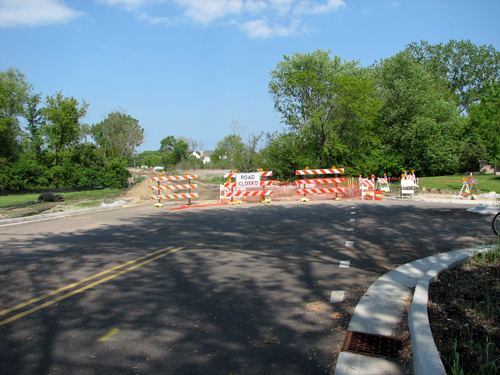 I was surprised to see that there was actually bike path along one of the main roads we’d take! The Drury Lane entrance to Rollins is closest to us, so that’s where we normally drive. On Google Maps I saw that there was a spur to the main trail from a small city park, so we wouldn’t have to cycle all the way to our usual parking lot, which was good news. The bad news was that Drury Lane is a torn up muddy mudville from construction.